Yesterday, one of the greatest symbols of peace died. The world mourns as the Nobel Peace Prize winner (1993) passed away at the age of 95. Films have been made about his life. News and new media lead the way in giving tributes to Mandela as the man who helped unite his country, and has became the defacto symbol of ending apartheid in South Africa. Jailed for 27 years because of charges against him for inciting worker strikes and various offenses, he understood what it meant to be persecuted and bullied. He knew the painful truth of what evils one human being can do to another. Arrested and then jailed in 1962, he was subsequently sentenced to life imprisonment and released only on February 11th, 1990. Why the arrests? That is simply because Mandela was seen as a threat to the status quo: of separation of privileges between whites and the blacks in South Africa. With his conviction to free South Africa from apartheid, he commits to winning over both the blacks as well as the whites for a new cause, a new country, and a brand new united African community. I find Mandela's life inspiring. If Martin Luther King Jr was a hero to the American black community in fighting for equality for the blacks; Mahatma Gandhi as a hero to the country of India in the fight for India's independent status; Nelson Mandela is the undisputed hero of South Africa, if not, all Africa. All three men had one thing in common: Peace. Peace did not come easy for the black people in the sixties. Gripped by rising tensions and fueled by hatred from the white extremists, Dr Martin Luther King Jr was assassinated in cold blood. The same thing happened to Mahatma Gandhi, who was murdered in broad daylight. Against all odds, amid acts of terrorism by opponents, Nelson Mandela, upon his release in 1990, worked hard to bring freedom for all, and eventually became the first democratically elected President of South Africa in 1994. 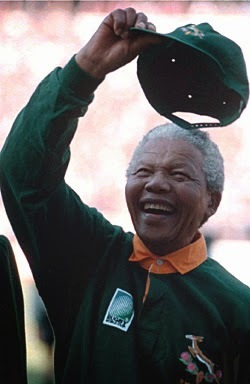 According to John Carlin, Nelson brilliantly used the game of rugby to unite the whole nation, setting the stage for eventual stability, freedom, and unity of South Africa. That occurred in 1995 when South Africa hosted Rugby's World Cup in 1995. With the New Zealand All-Blacks as the overwhelming favourite to lift the coveted trophy, many did not expect the South African national team (called the Springboks) to go far in the tournament. They were wrong. Not only did the Springboks go all the way to the finals, they beat the heavily favoured New Zealand team! In Carlin's words, it was that game, that match that "made a nation." In some ways, Mandela's life reminds us of what the Son of God had to go through. Both were unjustly accused and arrested. Both were charged. Both men were committed to do what is right. Mandela was committed to the cause of anti-apartheid. Jesus was committed to the obedience of God's will. If there is one thing that is common in the lives of Luther, Gandhi, Mandela, and Jesus, it is this: Peace is not cheap. It comes with a heavy price. Is it any wonder why St Augustine said: "The purpose of all wars is peace?" Even Jesus himself has said that he has not come to bring peace, but through him, there will be much war and opposition. The peace of God is to be understood in God's perspective. This is what the Christmas peace is about. The white opponents to Martin Luther King Jr's version of peace is more violence to anything the black people stands for. White supremacy groups are bent on exterminating the black people. Muslim and Hindu radicals are threatened by Gandhi's peace strategy, that the only way out for them is to kill Gandhi. For Mandela, he had lived to enjoy the fruits of his peace efforts, but only after much persecution and torture. This Christmas, say a prayer of peace. Live a life of peace. Share a word of peace. How can we do that and be a part of the peace movement? The secret lies in the most important first step. There must be peace in your hearts. Thomas a Kempis writes with wisdom: "First keep peace with yourself, then you can also bring peace to others."